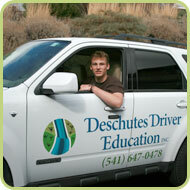 Deschutes Driver Education uses a 2011 Ford Escape 4 Wheel Drive and/or a 2002 Subaru Outback Wagon for all Behind-the-Wheel Instruction. They have dual control brakes and and equipped with front, side and ceiling airbags. The Escape and Subaru were chosen for our instruction because of there safety features, for the very clear sight lines they give students and instructors, for the overall comfort they provide for students and instructors and as a 4 Wheel Drives, there additional safety in adverse weather conditions.